So, suspecting that the first brush stroke put down had to be exactly the right one, this kept many people from enjoying working with water colors. I have created many water color project videos demonstrating the skills and techniques I have taught over the past 50 years, as well as several videos of my water color students working on some of the projects. 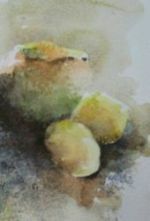 From these videos you will learn basic water color techniques, including: color mixing, washes, brushwork, masking, sponging, and working from a photo and from your imagination. Click here to start your FREE Water Color Video Projects. "I used to love doing art but then life got it the way and all of a sudden it had been 10 years since I picked up a pencil to draw or a brush to paint. I decided to make time in my life for art again, but didn't know where to start and felt so rusty. While researching online I came across Lois' website and it was the answer I was looking for! Lois' lessons are great for beginner and experienced alike, they are very professional and really are free like the website says! I have run across other websites that make this claim and then follow with hidden fees. Not only are the lessons free, but Lois will help you every step of the way just by sending her pictures of your work in progress! These lessons are a valuable asset for anyone wanting to bring art back into their life, or dip their toes in for the first time." ~ Rene Wagenaar.